The Right Honourable the Baroness Scotland of Asthal QC, Chancellor of the University of Greenwich, hosted a dinner on the July 15, in the Painted Hall of Greenwich’s Old Royal Naval College in London. At the dinner, Professor David Maguire, Vice-Chancellor, presented the award for Staff Member of the Year to Dr Jonathan A.J. Wilson; who beat off stiff competition from colleagues across the four university faculties. 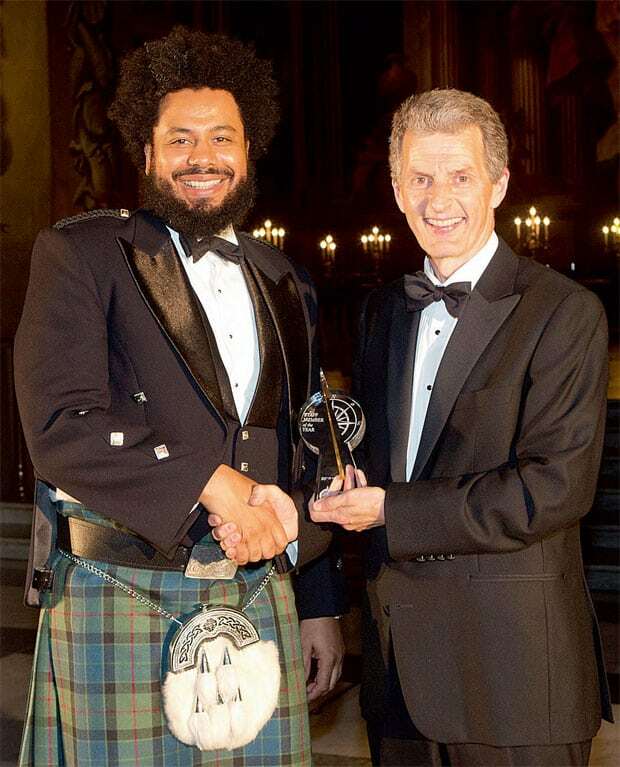 Rushdi Siddiqui caught up with Dr Wilson (who is also known as Bilal, since 2000, when he took his shahdah) to find out some more about the award-winning work that he has been doing. In particular, how he has established himself as one of the world’s leading brand experts on the halal industry. How did you become a leading brand expert in the halal industry? Why has ethical consumption become important? Globalisation and mass manufacture are in full swing; and social media has brought about a democratisation of information and opinion forming. These have pointed the spotlight on ethical consumption and a collective social responsibility, which businesses and consumers are all feeling. How is halal ethical, please give some examples? Any belief system or ideology has a core set of values and guiding principles. Halal overlaps with a lot of other approaches; although there is a lot of noise out there (largely socio-political), which is jamming the airwaves and getting in the way of Muslims and non-Muslims taking this concept forward. The spirit of spirituality, and profiting from the legacy of prophethood are the ethics that are central to all of this; but there’s still work that needs to be done where we are articulating the processes and principles to any business or consumer clearly, and to a level that is expected in the world today. One area that I think Halal can set the agenda on is the importance of human conscience and accountability; and extending this, the idea that people should practice what they preach. Professionalism shouldn’t be about whether you can shift units, even if you don’t consume or agree with the commodities that you are marketing to others. For example, whilst I agree that the flavour enhancer MSG (monosodium glutamate) is halal and acknowledge that it appears in some products; really we should be re-evaluating whether the halal community should be using it, and if we could take a stand against some of these ingredients. Then I think halal would gain more traction with the wider community. Halal seems to be about the slaughter, but it’s more, how to re-brand? Yes, halal is about more than meat and money (Islamic finance). Often halal is referred to as a brand. However, my view is that currently halal is a term used in a logo — because you can’t buy a ‘Halal’, like you can a Coca Cola, or an iPhone. A brand is a uniquely named, designed and identifiable proposition, linked to an organisation, which can be legally protected. Furthermore, the thing that elevates a brand above and beyond a logo is its own personal story, folklore, heritage, promise, acceptance, prestige, desirability, and communities. If we look at halal from this context then I would argue that more brand development is needed. What are key lessons for Halal from Islamic finance? They’ve been developed largely in response to a problem and need, but in isolation from each other. Now I feel is the time for them to join hands, collaborate and underwrite each other. Dubai wants to become capital of Islamic economy, what is your advice on branding? Dubai’s brand identity, story, provenance, and authenticity have to be driven home. This requires empowered stakeholders and ambassadors from inside and outside the region, just as the Japanese and Germans have been able to achieve. Perhaps a future area of development for Halal certification bodies, like supermarkets, is to have their own branded products. This approach could ensure that the economic and social capital associated with halal is preserved within the Muslim community — because if more and more products are certified globally, as is hoped, then it is possible that the majority of goods and services will be outside of Muslim control and ownership. The writer is a global leader and head of Islamic economy and senior partner at Dinarstandard. Views expressed are his own and do not reflect the newspaper’s policy. Views expressed by the author are his own and do not reflect the newspaper’s policy. « Opinion: Losing Halal Meat Market Synergies ?